You are probably here because you already know that Apple does not allow screen recording apps on the App Store. However, Vdyo (a screen recorder app for iPhone) managed to slip past the App Store’s verification process and went live for a day which let users record their screen. Unfortunately, you are not going to get another screen recorder app anytime soon! So, in this article, we will guide you with alternative methods to record iPhone Screen. Why Apple Does Not Allow Screen Recorder Apps on the App Store? It is a misconception when someone claims that iOS does not support recording of your screen. It does. However, as an additional layer of security and privacy, Apple does not allow screen recorder apps on the App Store. Apple would not bother you of Jailbreaking the device or sideloading an app, but it does pose a threat to your device’s security. In reality, if you allow a screen recorder app to function, the app can monitor your activity and (visually) record things you type. So, it is better not to have them installed even if you do come across an app on the app store that claims to do the work. If Screen Recording Raises Security Concerns, Why Use It? We do realize that screen recorder apps raise privacy concerns, but we also need to record our device’s screen for specific tasks. For instance, if you want to record your iPhone’s screen to show your friends how a game works. If you are a professional tech reviewer, you might find screen recording apps handy to help you make quick tutorials on a newly launched app or game. You can utilize the screen recording capability for such similar works which include both professional and experimental needs. If no app does the work, how would you record your iPhone’s screen? Do you need to Jailbreak your device? Sideload an app? Yes, you can do that. But, we would not recommend doing it that way. Instead, here, we have compiled a couple of software solutions which would help you record your iPhone’s screen through a computer without Jailbreaking the device or sideloading an app. Note: Ensure that both iPhone and your computer are connected to the same network. QuickTime is a media player developed by Apple. It comes pre-installed with Mac OS. It is available to download for Windows OS as well. However, recently Apple has ceased support for Windows OS which had some serious security vulnerabilities (you can still download it though). So, if you are running a Windows-powered system, you need to have a previously purchased pro key to make QuickTime work with the complete set of features because you cannot buy a pro key for Windows anymore. 1. Click on “File” and hover through the options to select “New Movie Recording“. 2. To record your iPhone’s screen. Click on the arrow icon, next to the record button and then click on “iPhone“. 3. 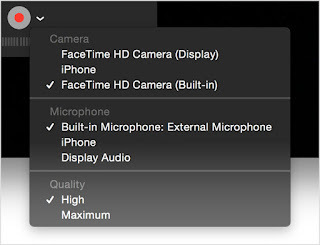 Now, click the Record button to start recording your iPhone’s screen.